Unless you're feeding a crowd, a large pork roast can result in plenty of leftovers. Don't let the food go to waste; refrigerate the leftovers and heat them up for dinner on another day. Just be sure to cut the roast into large slices or pieces instead of storing the entire leftover roast in the refrigerator, because this makes it easier to reheat the portion you need, the U.S. Department of Agriculture advises. And if you have more leftover pork roast than you can use in three or four days, freeze it for later use. Preheat your oven. The U.S. Department of Agriculture advises that pork roast and other cuts of meat be reheated in an oven with the temperature set no lower than 325 degrees Fahrenheit. Put the pieces of pork roast you want to reheat in an oven-safe dish or pan, such as a metal pan that is no more than 2 inches deep. This allows the meat to reheat quickly, limiting the time it spends in the temperature range in which bacteria can begin to reproduce. Place the dish or pan in the preheated oven. Allow the meat to cook for about 20 minutes before removing it to check its temperature. Insert a meat thermometer into the thickest part of the reheated pork. Pork roast and other types of meat should be reheated to an internal temperature of 165 degrees Fahrenheit. Place the pork back in the oven if it has not yet reached a temperature of 165 degrees. Check the temperature of the pork about every five minutes until it reaches the desired temperature before serving it. 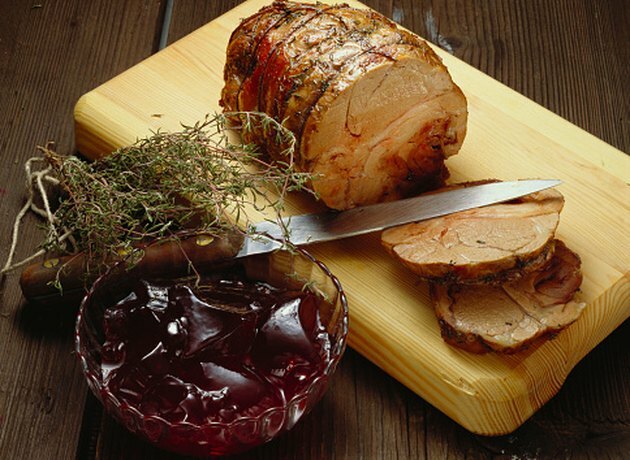 Place slices of pork roast in a microwave-safe dish and cover it. Put the pork in the microwave and cook it for about five minutes. If possible, use your microwave's setting for reheating meat. Remove the pork from the microwave and let it sit for a few minutes before checking the meat's temperature, the USDA advises. Insert a meat thermometer into the thickest part of the meat to see whether it has reached an internal temperature of 165 degrees Fahrenheit. Continue reheating the pork for two to three minutes at a time, checking the temperature at each interval. Place leftover pork in the refrigerator immediately, where you can keep it for three to four days. Any meat that has been left at room temperature for more than two hours or outdoors in temperature in excess of 90 degrees Fahrenheit for more than one hour should be thrown away, the USDA reports. Store leftover pork in shallow containers that can be covered or wrapped. Do not reheat pork roast and other meats more than once, the USDA advises. Also, never use a slow cooker to reheat pork because the meat may spend too much time at temperatures conducive for bacteria growth.